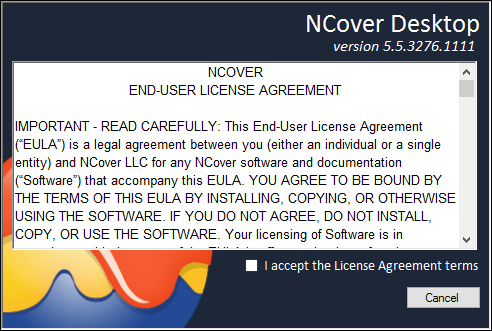 NCover 3 was installed from the NCover downloads page via a Windows installer, in 32 and 64 bit versions. 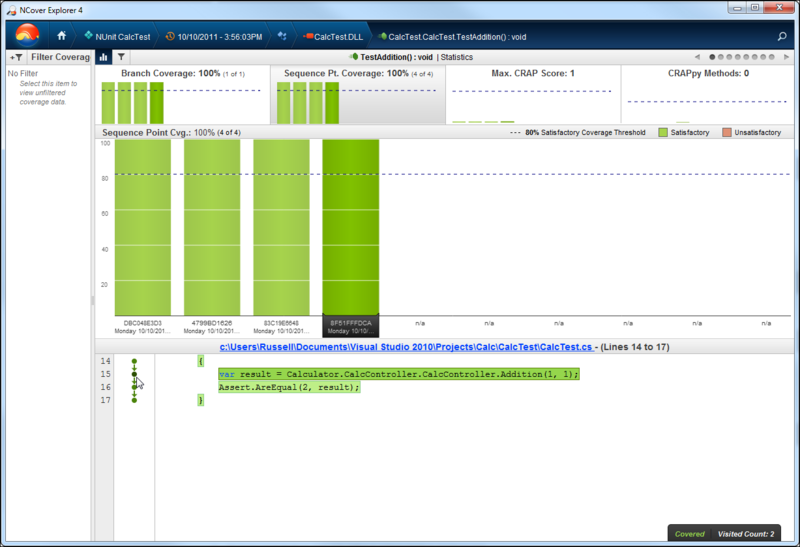 NCover 3x could be run from the NCover Explorer, a GUI interface which allowed you to generate and view code coverage information using a visual hierarchy. All the same functionality was also available in a command line format using NCover Console. The NCover install also included NCover Reporting, which was accessed either from the Explorer menu, or by using the command line. Reporting, which was integrated into the Explorer, allowed command line access for generating a variety of reports from available coverage files, as well as merging coverage data. NCover Desktop installs as a Windows service which sets global environment variables that allow it to access the Microsoft profiling environment, then runs in the background, ready to cover any .NET applications or services on your desktop or virtual machine. Both 32 and 64 bit versions are installed and managed automatically, so there's no need to choose which version you need and install them separately. 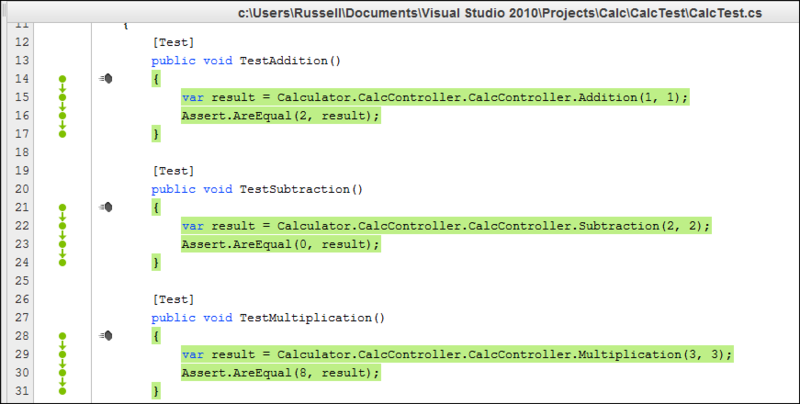 As in previous versions, NCover Desktop can cover managed code running in a .NET environment of 2.5 and above. 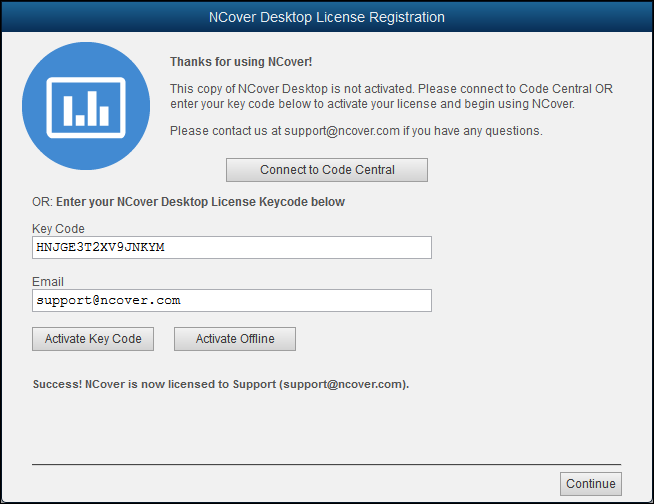 NCover 3 was registered using the Registration GUI, from the command line, or by using a license file, if the machine where NCover 3 was installed didn't have a connection to the internet. 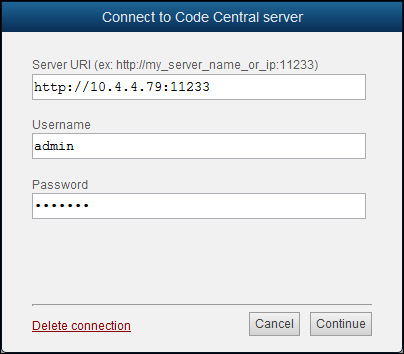 Server URI -- Enter the address of the local host and the port for the Code Central server. This defaults to 127.0.0.1:11233 at installation, but will connect to whatver IP you specify for Code Central. In NCover 3, covering a Windows console or WPF application meant browsing to the executable in NCover Explorer or specifying the path in NCover Console. 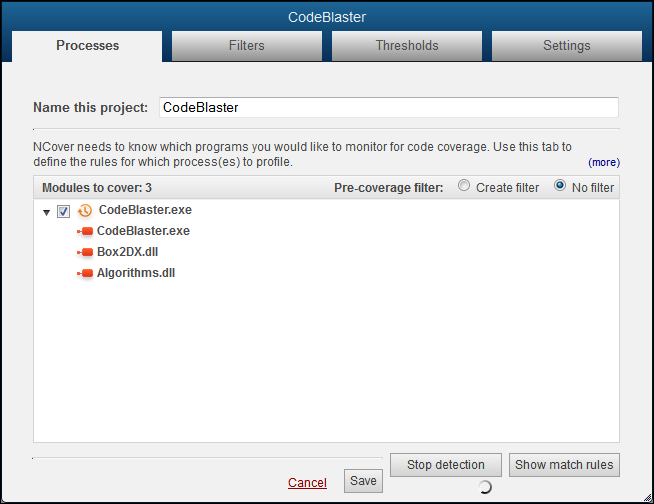 Once NCover had the correct path, running coverage allowed NCover to start the application and then profile the source code. Immediately to the right of your project name, the Modules Collecting counter displays the number of modules being profiled in the current execution of your project. The number will flRightuctuate while coverage is running, but the counter should eventually disappear when profiling is complete. NCover can now produce a self-contained HTML report to summarize an execution. This Coverage Summary report shows the coverage results of the most recent execution by default or an execution specified by the user. As a self-contained report, this file can be kept as a build artifact, shared via email or as a static web page. 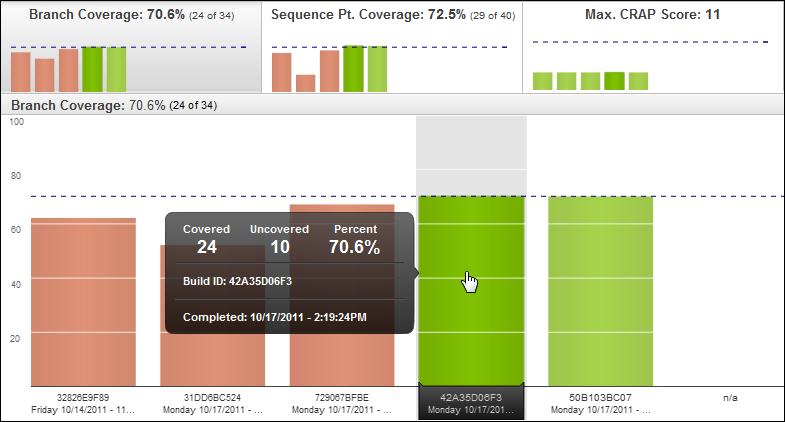 The Coverage Summary report can be generated from Code Central and from Desktop. Please note that Desktop does not server external pages, so the links in a report from Desktop will all point back to loal host (127.0.0.1). When generated from Code Central, the Coverage Summary has hyperlinks back to the live coverage results within Code Central. 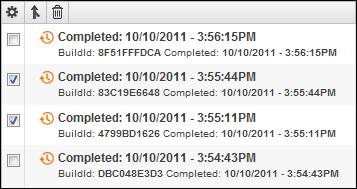 These data views can be seen by anyone who can access the Code Central server and has an valid CC login. 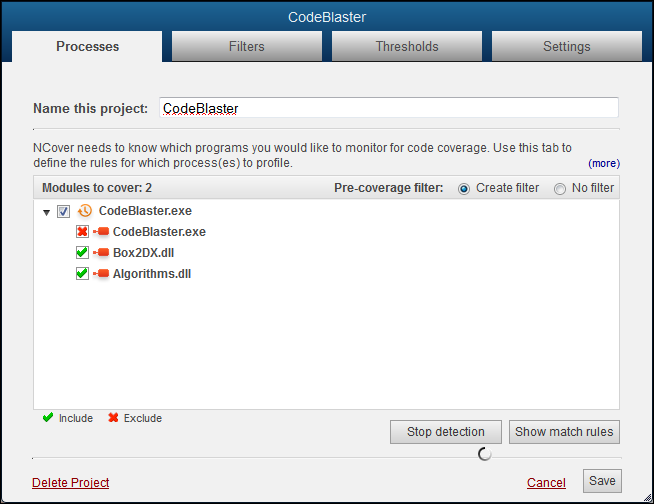 NCover.exe report --project="MyProject" --execution="MyTestCoverage" --file="MyCoverageReport"
The NCover Explorer provided a graphical way to examine coverage results from a tree view and a source code window. 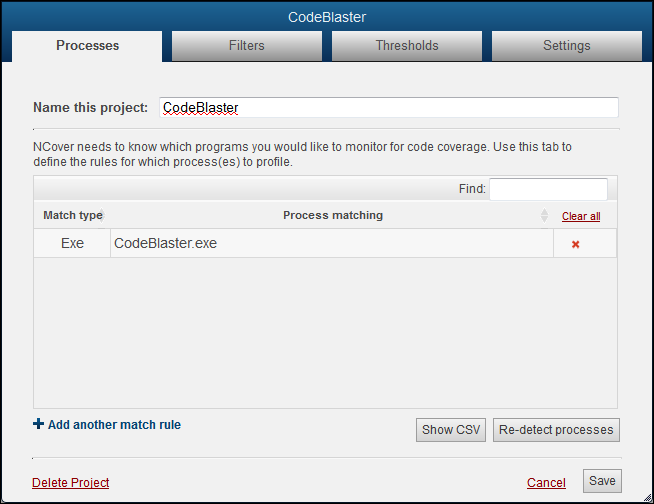 You could set project options, merge files and generate reports from the Explorer, as well. With NCover Desktop, your coverage data is always in front of you. The Data Coverage View changes dynamically to display the data that's relevant to the level of code you're viewing. Once an execution is complete, clicking on the name of your project from the Home page will change to the Project View, with a slider-driven list of Statistics at the top, the Branch Coverage or last selected report in the Coverage Data View, and a list of completed Executions, their logs, and statistical summaries at the bottom, in the Coverage Navigator pane. 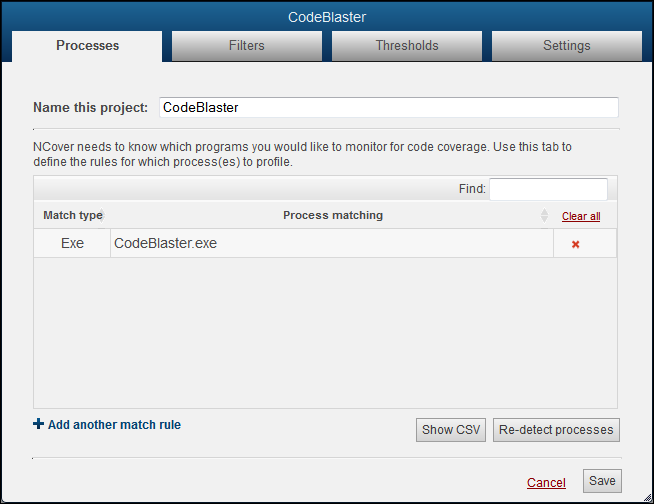 NCover Desktop generates coverage data when an execution is completed successfully. Using the Visual Studio plug-in, this coverage data can be viewed in a variety of ways, detailed in the Viewing Coverage Data section. 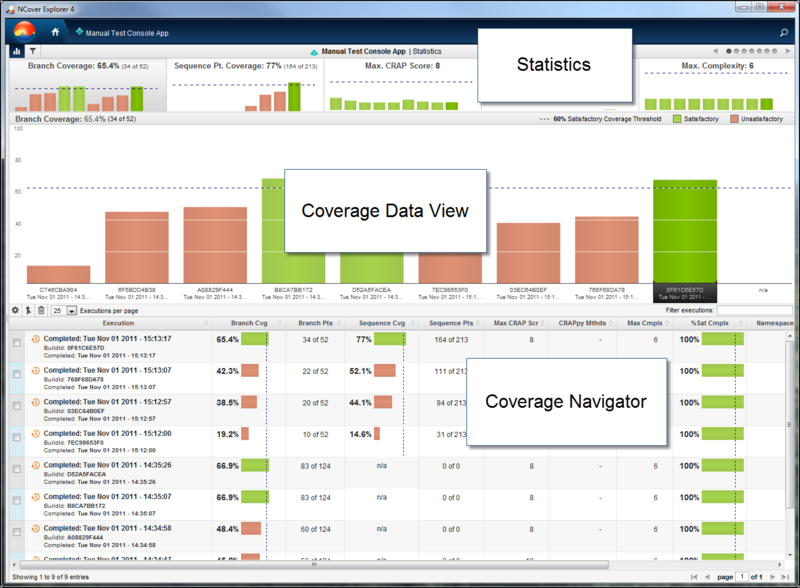 NCover Desktop offers several more intuitive ways to manage, view and drill-through your coverage data. The "breadcrumb" hierarchy at the top of the Desktop shows where you are in the coverage data -- by Project, Execution, Module/Document, Namespace, and Method -- and allows you to easily move back up as many levels as you like. You can go Back or Forward to previously viewed pages by right-clicking anywhere in the Desktop window. NCover Desktop will also alert you with a toast pop-up notification at the top of the Desktop browser window when new coverage data is available. At the Project View and below, the Statistics view in the top panel of the Desktop window displays data relevant to the selected Execution. 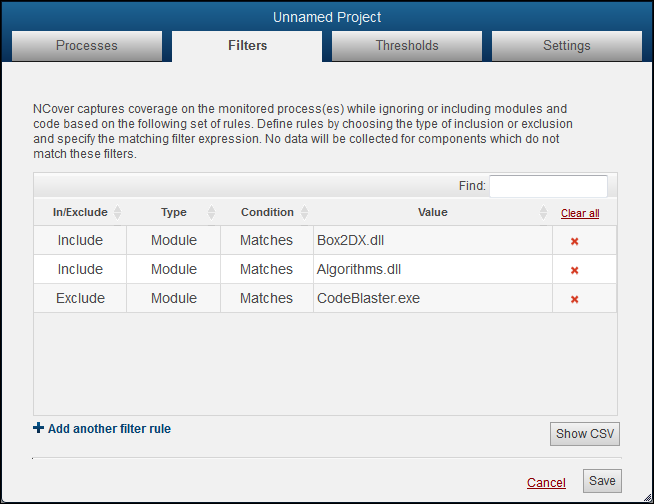 The runtime include/exclude functionality of NCover 3x has been integrated into NCover Desktop's Filter Coverage. 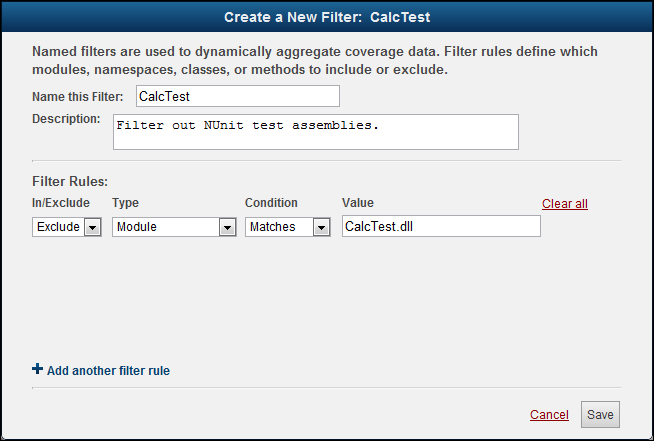 Filtering is available for every data view below the Home page and is applied by creating Filter Rules. 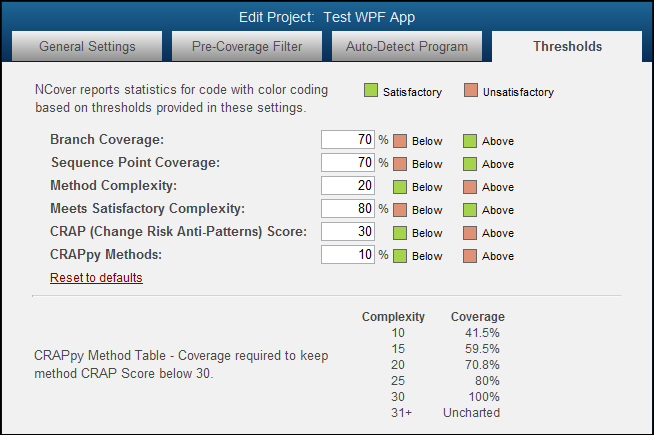 NCover reports coverage statistics with color coding based on the thresholds provided in these settings, which are set with some reasonable default values when you create a project. You can reset these values at any time by clicking on Reset to defaults. 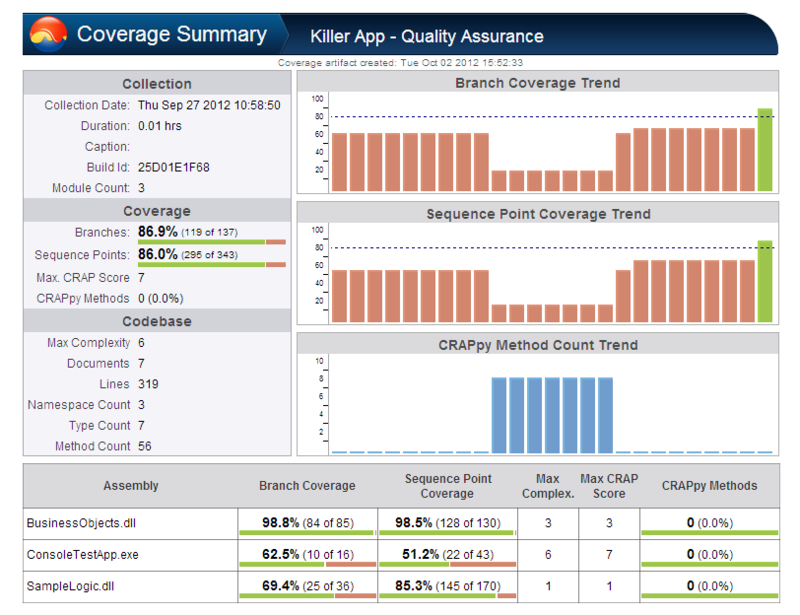 NCover will now merge coverage data for assemblies which are identical at the source code level. 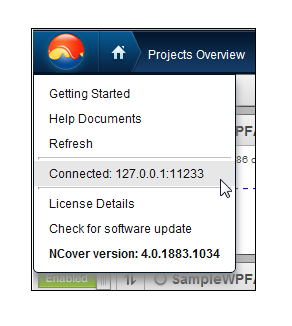 NCover 4.1.2101.816 is the first build to contain this new coverage merge functionality. This new merging strategy means that even assemblies with mismatched version numbers and binary hash can be merged if the source code can be verified as identical. You can import NCover Desktop coverage data from one machine to another, or import your NCover 3 coverage data file for viewing in NCover Desktop using a command line utility. Note that NCover Desktop metrics, such as CRAP and Max Complexity, don't exist in NCover 3 and won't be visible in NC3 data imported to NCover Desktop. Project name - The NCover Desktop project to import from. You can also export your coverage data file using the included command line utility. The default export format is a Zip file containg JSON data, but another format option is an NCover 3 compatible XML file. Project name - The NCover Desktop project to export from.